From wearables to smart lighting, voice control is increasingly becoming consumers' preferred way to interact with electronics. As developers build products of various sizes and designs to meet consumer demand, they often have trouble scaling to meet different Bill of Materials (BOM) and form factor requirements in end applications. Microchip Technology Inc., via its Microsemi Corporation subsidiary, today announced that its AcuEdge™ ZLK38AVS Development Kit for Amazon Alexa Voice Service (AVS) now introduces far-field voice pick up and the flexibility to build devices with multiple mic array configurations. The solution reduces BOM costs while addressing the requirements of small-form-factor designs. As a leading audio front-end development kit with one-mic hands-free and two or three-mic far-field configurations qualified by Amazon, the solution features the ZL38063 audio processor which includes a 300 MHz DSP and dedicated hardware accelerators for voice processing. It also features Stereo Acoustic Echo Cancellation (AEC), which enables barge-in recognition to improve the consumer experience in extreme audio playback environments. One-mic configuration – Offers hands-free voice coverage for products where form-factor or cost constraints preclude the use of a multi-microphone array. Two and three-mic linear (180-degree) configurations – Designed for sound bars, smart plugs and switches, set-top-boxes or other applications typically positioned against a wall that benefit from 180-degree far-field coverage. Three-mic triangular (360-degree) configuration – Also with far-field coverage qualified by Amazon, this configuration is well suited for applications that may require user interaction from any direction such as portable speakers, wide-angle IP cameras and voice-enabled Wi-Fi® routers. The development kit enables far-field speech recognition in the presence of interfering noise sources, including device playback and external noise sources. The field-programmable, field-upgradable solution features signal processing algorithms proven to improve both local trigger detection performance and cloud speech recognition accuracy, while the multi-microphone configurations include Direction of Arrival (DOA) estimation to indicate where the primary voice sound source is located. 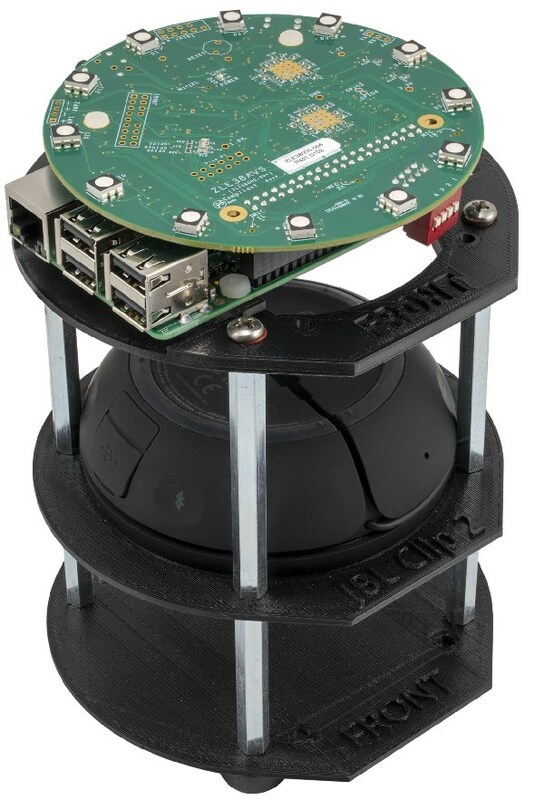 The development kit includes a ZL38063 audio processor that connects directly to a Raspberry Pi® 3B with plastics and mounting hardware to simulate a typical, recommended end-application mic-speaker arrangement. It supports all microphone options and includes an LED ring to report the detected sound location, as well as a high-quality speaker that is representative of a typical smart speaker application. Microchip has audio labs and tuning facilities located worldwide that support customers from design through Amazon certification.